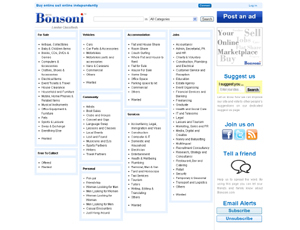 Bonsoni.com is an online marketplace for buying and selling items, properties, finding a flat share, jobs, local services, free to collect items and many other categories. People will be able to buy and sell their unwanted items without paying any fees. We believe that someone’s junk is someone else’s treasure. In this economic climate people are constantly looking for ways to earn some extra cash. Anyone can post an ad in less than a minute and start selling stuff straight away. Our simple one page ad posting is very easy to use and even it automatically registers the ad posters. Did we mention this is totally free?